DEUCE RICHARDSON (pictured here at KU’s legendary “Day on the Hill” festival) read Edgar Rice Burroughs’ Tarzan and the Jewels of Opar at the age of eight. A Fighting Man of Mars followed soon after. Primed by the feral savagery of Lord Greystoke and the bloody swordplay of Barsoom, having his sainted grandmother buy him Conan the Barbarian #38 was the logical next step. From there, it was on to the Glenn Lord-edited The Book of Robert E. Howard — Howard’s historical/boxing/fantasy/western/weird menace fiction contained therein (along with REH’s immortal poetry) permanently warped young Deuce’s mind. A Gnome Press edition of Conan the Conqueror (from the Parsons Public Library) came next, along with the fiction of J.R.R. Tolkien as well as anything else worth reading. Football, streetfights, rock ‘n’ roll guitar, college and a trip to the British Isles were subsequent. In May of 2007, Deuce became a moderator on the Official Robert E. Howard Forum, and in June gave a presentation delving into Robert E. Howard’s Thurian Age at Howard Days in Cross Plains. He also contributed to 2008’s Les nombreuses vies de Conan, a book edited by Simon Sanahujas which examined the pop cultural impact of Robert E. Howard’s Conan the Cimmerian. 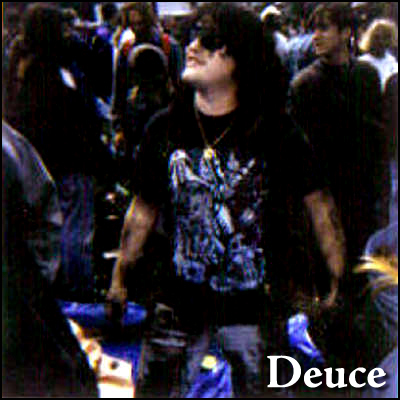 Deuce Richardson resides in Pittsburg, Kansas. 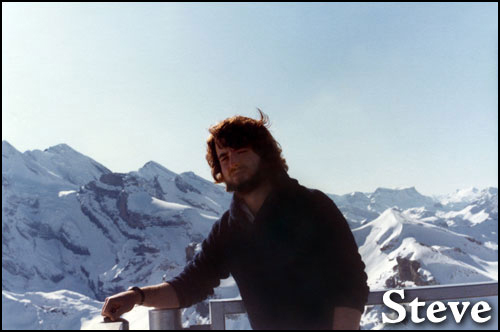 Our late, lamented friend STEVE TOMPKINS (1960–2009) — pictured here atop Switzerland’s Piz Gloria, Blofeld’s Alpine fortress from the James Bond film On Her Majesty’s Secret Service — was the heart and soul of The Cimmerian‘s blog from its inception to his untimely death on March 23, 2009. He was the editor of the Robert E. Howard anthology The Black Stranger and Other American Tales (University of Nebraska Press, 2005), and contributed the introduction to Kull: Exile of Atlantis (Del Rey, 2006), as well as the accompanying essay for the highly collectible The Black Stranger original manuscript facsimile (Wandering Star, 2002). A lengthy critical statement, “Barbarian at the Pantheon Gates,” appeared as an appendix to The Best of Robert E. Howard Volume 2: Grim Lands (Del Rey, 2007). A 1995-2007 member of the Robert E. Howard United Press Association, Tompkins had written about REH for The Cimmerian print journal, Don Herron’s The Barbaric Triumph, Jim Keegan’s The Illustrated World of Robert E. Howard, REH: Two-Gun Raconteur, and The Robert E. Howard Companion. Raised in Connecticut, Tompkins spent two semesters in the old university city of Freiburg-im-Breisgau. Since 1990 he had lived in Brooklyn. It’s no exaggeration to say that Steve was likely the single most well-read individual in all of fantasy fandom. Over the last decade, and particularly since this blog’s inception, he had also grown into one of the field’s most perceptive, unique, and delightful critics. He used to joke that in his spare time he could be found brooding about things like the fact that Tolkien never wrote any more of “Of Tuor and His Coming to Gondolin” than the pages we have in Unfinished Tales. He also re-read the Iliad every couple of years, hoping against hope that this time Hector would succeed in burning all of the black ships and driving the Achaeans into the wine-dark sea so that Priam’s proud citadel could survive. Steve’s death at only 48 years of age forms the worst blow to Robert E. Howard scholarship in many a year, and he is sorely missed by his legions of friends and admirers throughout the fantasy arena. All of Steve’s archived posts can be easily accessed here. From 2004-2008, LEO GRIN was editor of The Cimmerian, a popular literary journal about Robert E. Howard that was twice nominated for a World Fantasy Award. In 2005 he created The Cimmerian Blog as an adjunct to the print journal, and upon completion of the journal’s run in December 2008 gathered together some new writers to keep the blog going in a post-TC world. Grin’s centennial overview “The Everlasting Barbarian: Robert E. Howard at 100 Years” appeared in Weird Tales magazine in August of 2006. Another essay on REH titled “The Reign of Blood” can be found in The Barbaric Triumph (Wildside Press, 2004). A former member of the Robert E. Howard United Press Association, in 2006 Leo completed an ambitious digital archive of that organization’s thirty-four-year publishing history — all 30,000+ pages of it. In 2002 he had the good fortune to purchase one of the only surviving copies of Howard’s first book, the ultra-rare A Gent From Bear Creek (Herbert Jenkins, 1937). The tome was promptly donated to the Robert E. Howard Museum in Howard’s hometown of Cross Plains, Texas. Born in Chicago and raised in Indiana, since 1996 Grin has called Los Angeles, California home. Gentlemen: it’s our duty to report that Barbara Barrett, erstwhile Cimmerian blogger, has been caught engaging in Orwellian “social justice” bully behaviors against REH fans. An increasingly fervent proponent of feminist thought-policing and Codes of Conduct since entering this overwhelmingly male and non-ideological field several years ago, Barrett has recently weaponized her rhetoric in an attempted ISOLATION and DISQUALIFICATION of the most revered Sword-and-Sorcery expert in pulp fandom: former Official Editor of REHupa Morgan Holmes. His crime? Associating with Hugo-nominated fantasy author and longtime social justice critic Vox Day (A Throne of Bones, The Last Witchking, et al), thus violating Barrett’s cultish SJW narrative. Step #3 — Isolate and Swarm: ATTEMPTED (inexplicably the requisite mob of weak men needed to support her strong feminism has failed to materialize). Her goal with all of this is clear: ruin the reputations and livelihoods of two men, put the fear of suffering the same fate into everyone else, and then shame that cowed group of non-ideological male fans into establishing a fem-friendly code of conduct that would facilitate her becoming The Elderly Nazi Den Mother of REH Fandom, allowing her to ban WRONGFUN and BADTHINK wherever she might find it. The Cimmerian Blog has been defunct for half a decade, but now that one of our former bloggers has been exposed as an SJW, we feel impelled to rise from our slumber to declare that we stand 100% against SJWs and their travelling freakshow of interlocking fetishes and predatory abuses. 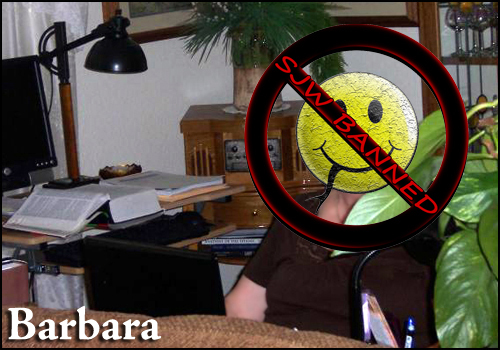 As a now-confirmed SJW, Barbara Barrett is hereby EXPELLED from this blog. We have struck her prose from every post, and her face from every picture. Let her name be unheard and unspoken among us, erased from the memory of our august fellowship, for all time. So let it be written. So let it be done. 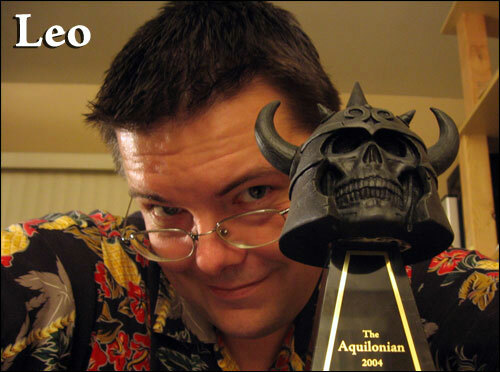 We publicly express our support, unequivocally and without reservation, for Sword-and-Sorcery expert Morgan Holmes, as well as for fantasy author Vox Day. Both are great and good friends of REH fandom, and of liberty. Anyone wishing to learn more about the scourge of SJWs in our society — and how to defend yourself against their cretinous attacks — would do well to purchase Vox Day’s instant classic SJWs Always Lie: Taking Down the Thought Police.